The pound was quoted at 1.75 against the SGD on Thursday, up slightly from Wednesday's 1.74, following British Prime Minister Theresa May's win in the no-confidence vote on Wednesday. A SINGAPORE housewife with three children studying in London told The Business Times that she changed about S$90,000 for British pounds last year, when the sterling dipped below 1.8. "After that, I refused to change anymore because I don't know where it's going," she said, in a reference to the volatility wrought by Brexit. She isn't the only one exasperated by the daily headlines on the UK's bid to leave the European Union (EU); bankers are fielding calls on the future level of the pound. 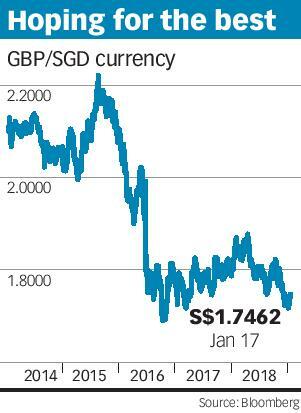 The housewife, who declined to be identified, recalls the pound being worth S$2 in 2016, when her eldest child left for the UK, but in October that year, following the June 23 Brexit referendum, the currency sank in a flash crash to a low of 1.69 against the Singapore dollar (SGD). (It has recovered to between 1.75 and 1.9 in the last two years.) She estimates that the tab for her childrens' university education in the UK to cost about £270,000. Philip Lee, DBS Bank senior currency economist, said he has been getting phone calls from individuals seeking clarity, "not just on exchange rates, but also about tariffs and how the UK will trade with the rest of the world". "I've been getting a lot of questions ... British politics and its newspapers are a nightmare to sieve through." There are many scenarios, but most economists and FX strategists see two or three situations unfolding in the short term - a delay to an orderly exit, another referendum and / or a snap election, or, in the worst case, a no-deal disorderly Brexit on March 29. Many now say the worst-case scenario is low on the cards. Mayank Mishra, Standard Chartered Bank global FX and macro strategist, said: "We think markets are assigning low probability to no-deal Brexit, as a majority of UK MPs agree on avoiding that outcome." Tan Teck Leng, UBS global wealth management and FX strategist, said in the worst case of a no-deal Brexit, the GBP against the US dollar could fall to 1.15, which could in turn bring GBP-SGD to 1.55-to-1.60 levels. If another referendum comes to pass, the direction of the GBP would ultimately depend on the result of the referendum, but in the lead-up to the vote, expect the GBP to remain volatile, he said. If there is a snap election, the "implication would simply be a further delay of a few months to the whole Brexit process. The uncertainty that this brings, is negative for the UK economy and the GBP; the GBP-SGD could come under pressure and trade in a 1.70-to-1.75 range amid the snap election process," said Mr Tan. "The fate of the GBP is rather binary. A no-deal disorderly Brexit would be very damaging to it; in a smooth orderly Brexit, the GBP will recover to 1.40 for GBP-USD and around 1.90 for GBP-SGD as the UK economy recovers from the uncertainty, and the central bank proceeds to hike rates," he said. "We take the view that both UK and EU have an interest to reach an orderly Brexit; hence the GBP should recover, albeit only gradually." Sim Moh Siong, Bank of Singapore currency strategist, said that if a no-Brexit happens, it would be the best outcome for the pound and the British economy. The currency could appreciate to 1.80-1.90 against the SGD. In an orderly Brexit, the GBP-SGD would range from 1.75 to 1.80; in the worst no-deal Brexit, it would be 1.60-1.70, he said. The Bank of England, in its report to the UK Parliament in November, said in a disorderly Brexit, the pound could collapse 25 per cent against the US dollar and the euro, and inflation could peak at 6.5 per cent. In order to bring inflation back to the 2 per cent target, Bank Rate rises sharply, peaking at 5.5 per cent and averaging 4 per cent over the first three years of the scenario, it said. "The weakness of output and incomes, alongside rising interest rates and a pronounced tightening of financial conditions, results in sharp falls in some asset prices. Residential property prices would fall by 30 per cent, and commercial property prices, by 48 per cent." Vasu Menon, OCBC Bank vice-president and senior investment strategist, said the situation is still developing: "The UK has a long economic and political history and it has faced several economic and political challenges and survived.
" ... In the long term, the UK may regain its composure after some initial difficulties, should Brexit take place, so the outlook for the property sector and other sectors in the UK may not be as dire as some may fear. Political events are still playing out, so it is best not to make premature and impulsive decisions until we get better clarity." DBS' Mr Wee said Singaporeans who went through the Asian Financial Crisis are not that fazed, as they have seen worse.